We took a camping / hiking vacation in September. This can be a lovely, if sometimes rather cool, time to go camping. 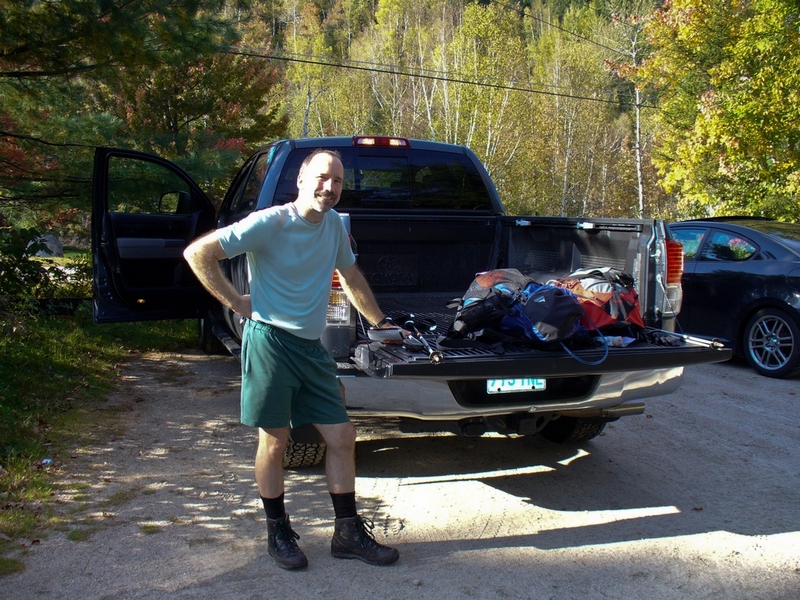 We decided to again go to Dolly Copp Campground near Mount Washington. This is a nice campground, very woodsy, with many mountain hikes in the area. 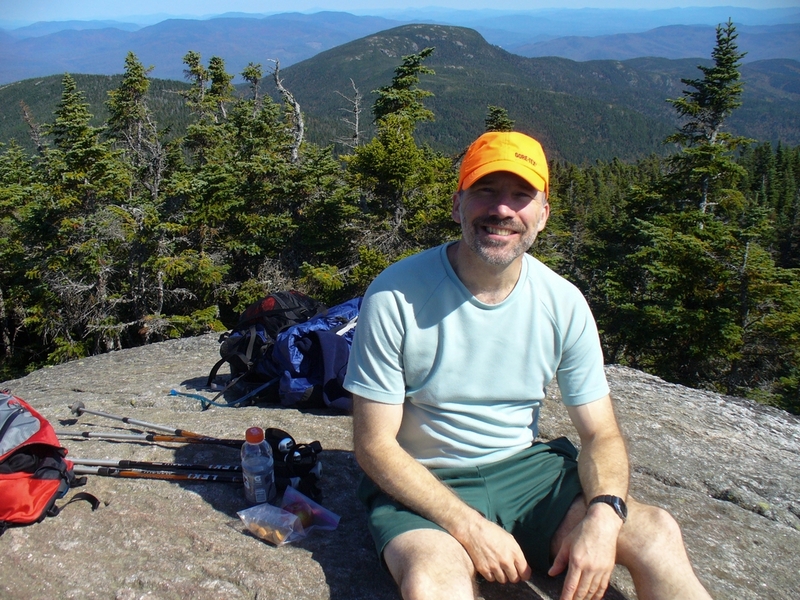 (That is Mount Madison in the background of the above picture, which we hiked in 2007.) We'll start off with a couple pictures of us and the camp site Monday evening. 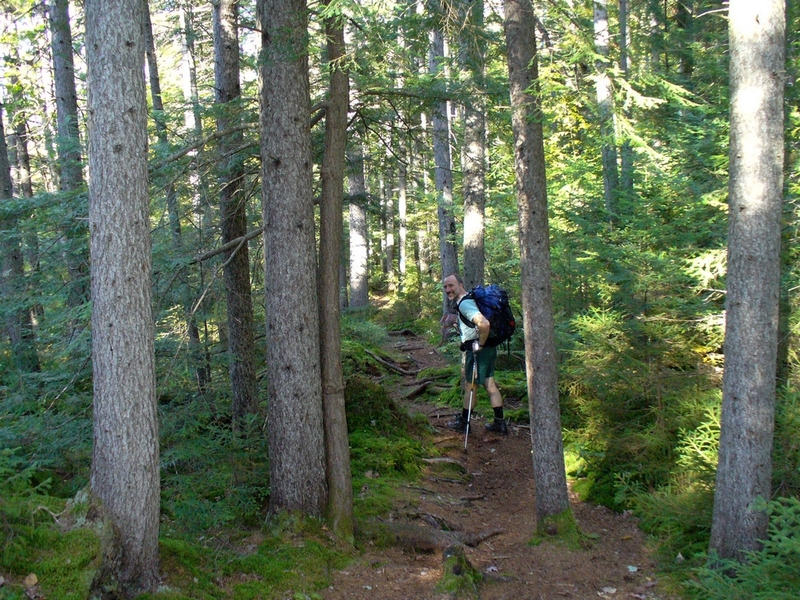 Of the peaks in this northern section of Mount Washington Valley, the one we had not yet been up was Mount Moriah. So our first day (Tuesday), we hiked up the Stony Brook Trail. 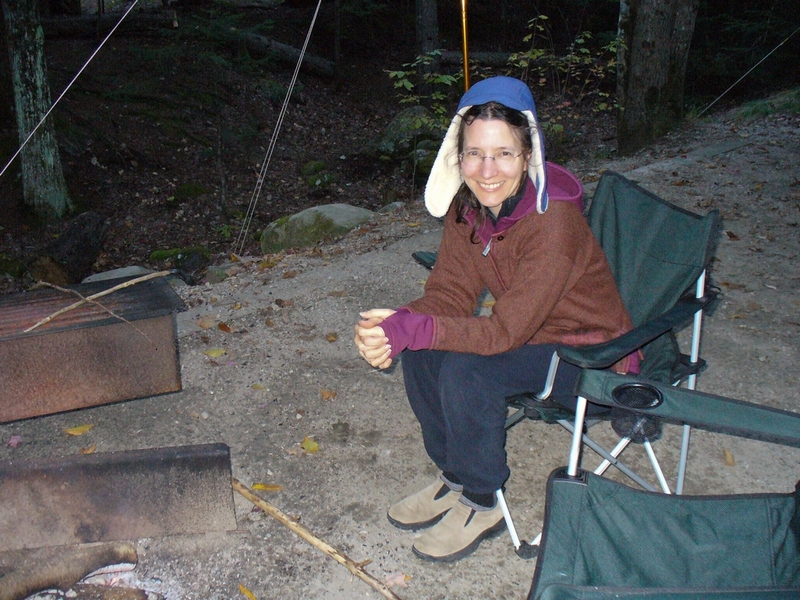 Aunt Diane found a 7 minute video with excerpts from a hike someone had done in 2011. It gives a nice overview of the hike. The hike starts along a talkative (and stony) brook, and after a few miles reaches the Carter-Moriah trail (which is part of the Appalachian Trail). 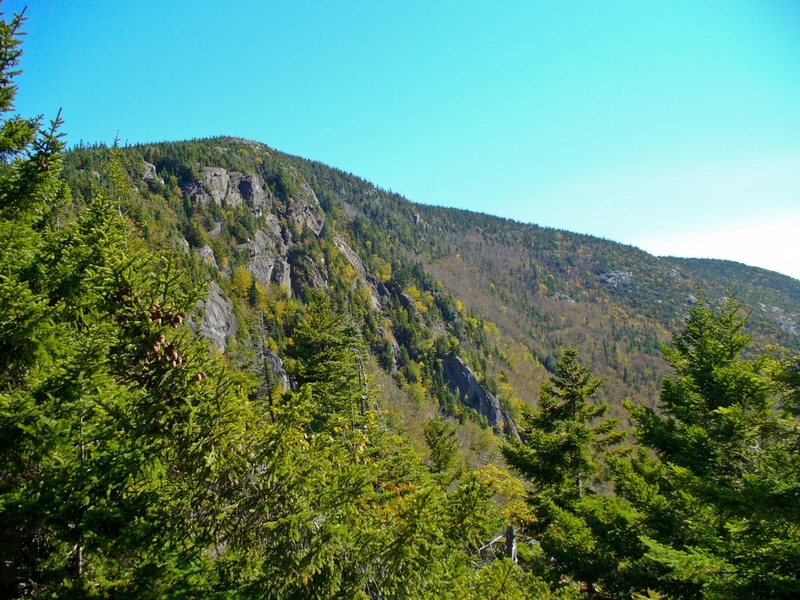 From there until the peak, there are many opportunities for views of the surrounding area. 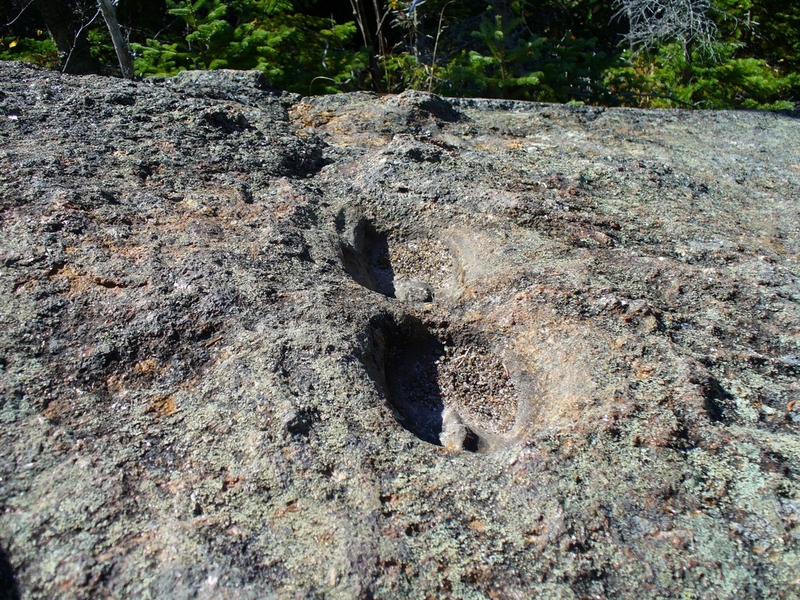 On the Carter-Moriah Trail there are marks in the rocks that look for all the world to be fossilized prints. The rocks didn't really look like sedimentary rock, so we are not certain if these are actually prints or not. At the summit, Paul took a 2-minute video with his phone, with a description of what he was seeing. And here is a picture looking Southwest from the summit, with the mountains notated. Paul wants an easy access to our trip reports for those various hikes, although I actually didn't create one for each. 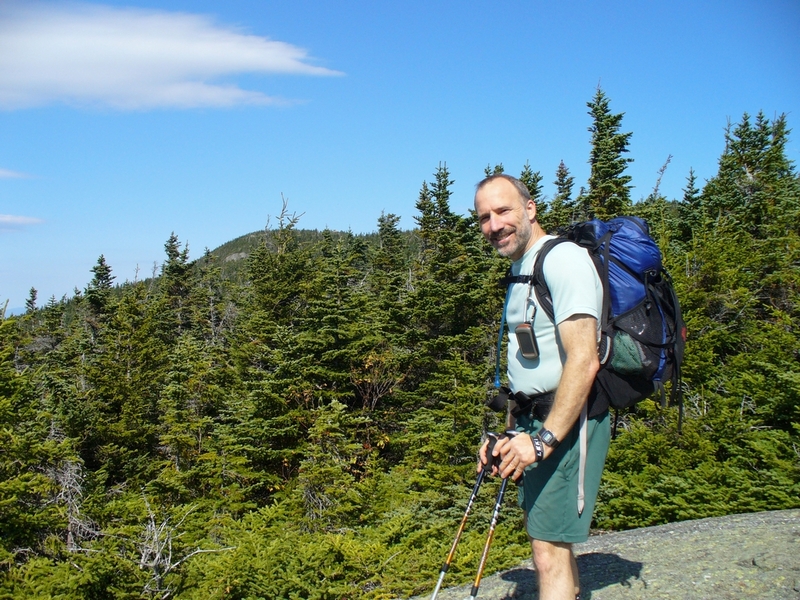 2006 - Mt Washington. 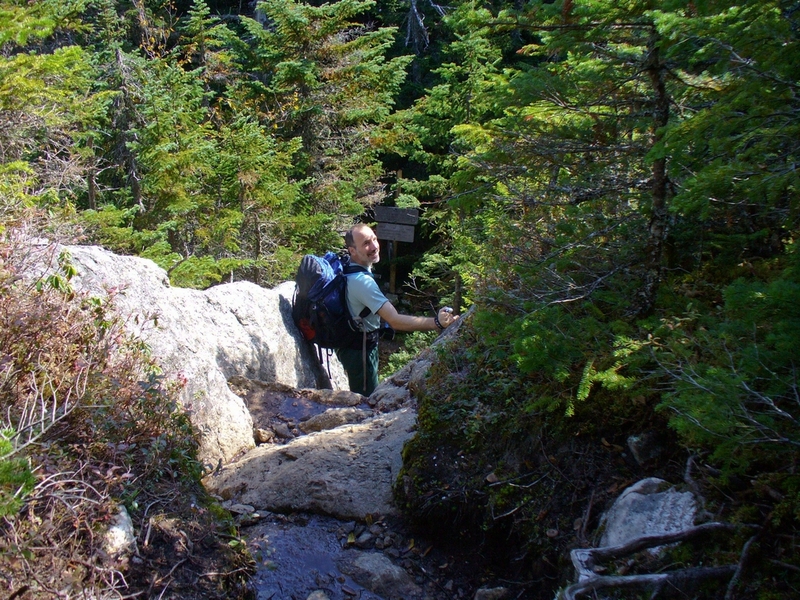 2007 - Mt Madison. 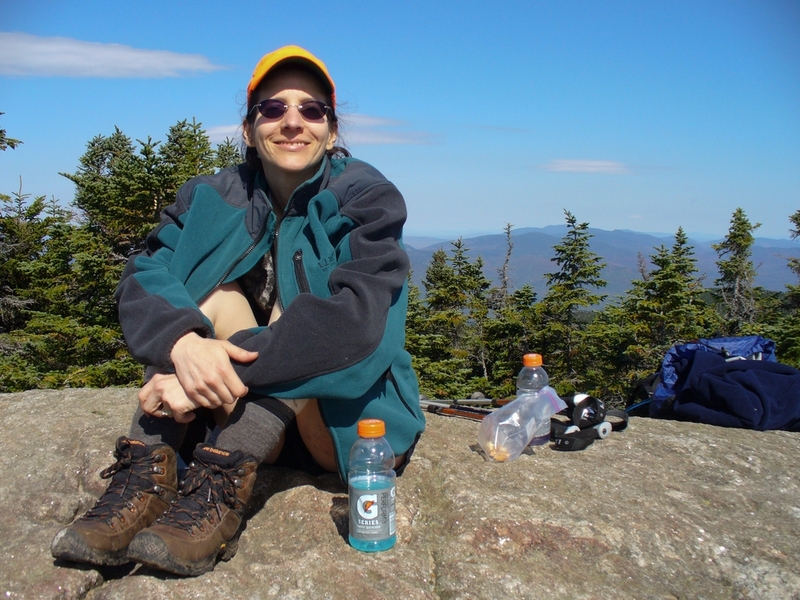 2008 - Mt Jefferson. 2009 - Wildcat, and Carter Dome (in the summit video but not the picture). 2010 - North, Middle, and South Carter. 2011 - Mt Adams. 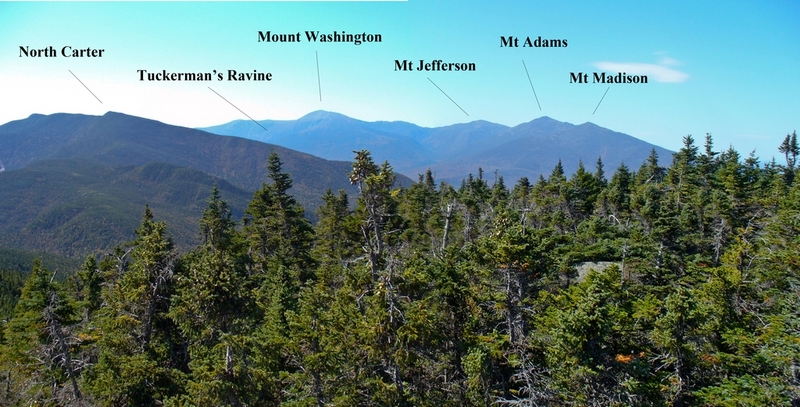 Of course, Mt Washington is substantially higher than where we are (Mt Moriah is just over 4000 ft in elevation, while Mt Washington is well over 6000 ft high) even though it doesn't look that much taller in the photo. It was a gorgeous day. The sun was brilliant, there was only a light breeze at the top of the mountain, and it was not uncomfortably hot for hiking. We were able to enjoy our lunch at the top of the mountain. If you watched that 7-minute video, you saw the steep scramble section just before the summit. Here is Paul descending that portion. We always pack for unexpected events. It gets very cold overnight this time of year, so we want to be prepared for emergencies, and bring warm clothing. We did end up carrying more water than we needed for this hike. But of course you just never know what might happen. 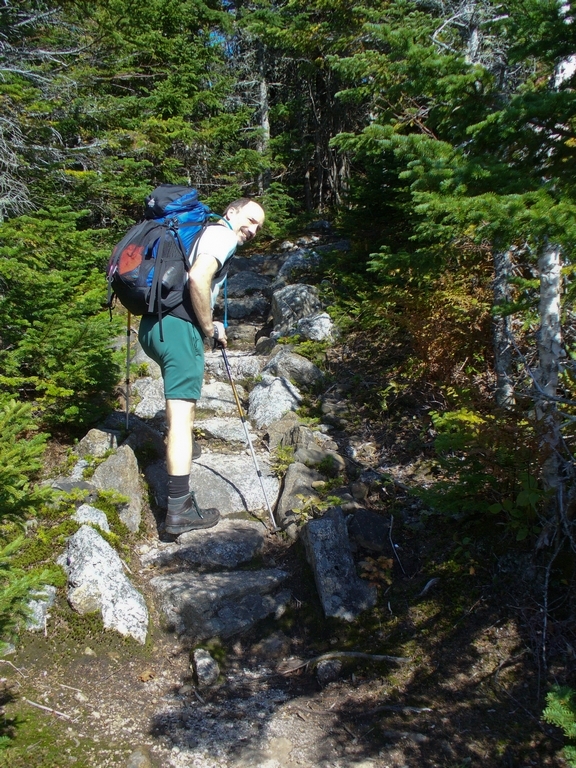 (You might remember back in 2008, my hiking boot fell apart at the summit of Mt Jefferson. Now we carry twine.) The disadvantage of this is that we end up having big packs. The advantage, in addition to being prepared, is warm layers to put on at lunch. It is one of those strange phenomena. After hiking, we were very comfortable in our shorts and t-shirts. And really, it was a lovely day. 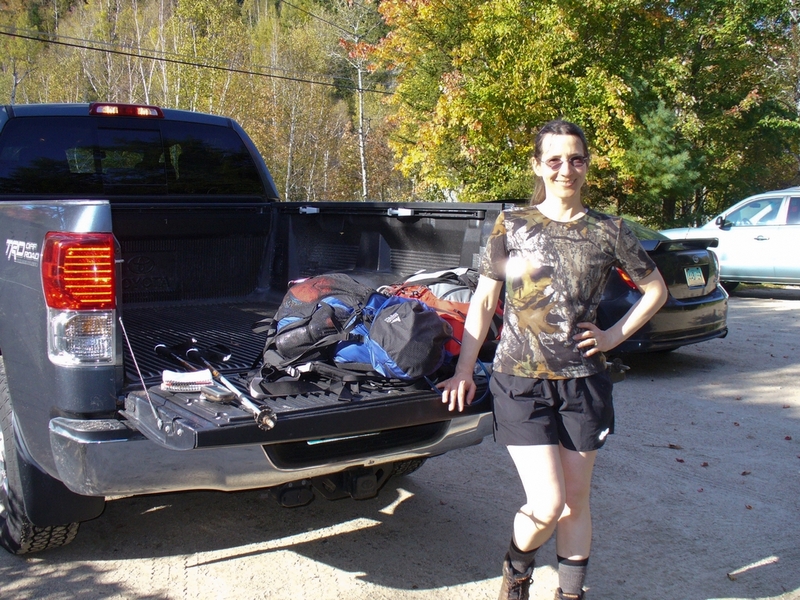 But almost as soon as we got back to the campsite, we both immediately changed in to warmer clothing. Part of that might be that the site is in the woods, with very little sun sneaking in.